Corn stalks can be an option to allow more time for more forage growth. The older I get, the more I tend to philosophize about things. I’ve been asked a few times why I am such an advocate for sound grazing practices. Best management grazing practices, just like conservation practices for reducing or preventing soil erosion on cropland, help preserve and or regenerate resources not only for present generation, but also for future generations. Keeping a field in forages will save more soil and conserve more water than almost all other erosion control practices. As the world population continues to increase and the acres of viable land that we can grow food on continues to decrease, we have to be more efficient and more productive with what remains while also maintaining and improving water quality. Food quality and nutrient density need to also improve. I’ll refrain from getting too deep and prevent you from possibly thinking you need to put on gum boots. I will say that there is satisfaction having a public service position that can provide a positive influence on someone else or on the resource. But, like any position, especially thinking about teachers, it has it’s challenges. You can lead the horse to water, but you can’t make it drink. I mentioned last month that we are on a count down to the first frost. I’m thankful for timely rains and that most of our cool-season grasses will continue to grow even after that first frost, as long as there is moisture working with the declining light hours. Most producers, including myself, would benefit from being more efficient. That efficiency is achieved first by optimizing forage growth. I’ll probably be lying on my nursing home bed, raising up my grazing stick cane and still repeating the line, “Don’t over graze it, maintain that solar panel, and keep the ground covered!” Every growth day now is an opportunity to grow more forage for later use. Most of the Midwest will be short in hay this winter so you may really have to be creative or think outside your normal box to keep enough feed in front of your livestock. What can you do to maximize forage growth? The more you can grow now, during these remaining autumn days, the more you will have to graze and the less feed will be needed. The first thing to think about is what can be grazed right now so forages can continue to grow? There will be a lot of corn that will be harvested soon. Grazing corn fields can certainly buy you some forage growth days. Every day the livestock are out ingesting some corn residue, they are not grazing forages and so your stockpile is able to grow. Corn residues normally are best utilized within 60 days of harvest and also allocated out in portions to reduce waste. In general, corn stalks have a crude protein value of about 8 percent and a total digestible nutrient value of about 70 percent. The nutritional value falls over time to about 5 percent crude protein and to about 40 percent digestibility. This reduction can be two-fold. First, if livestock are not managed in such a way to allocate the residue out over time, they will eat their dessert first which is the most palatable, and leave the broccoli for later. Second, nutrient content decreases over time as the residue weathers and soluble nutrients leach out. 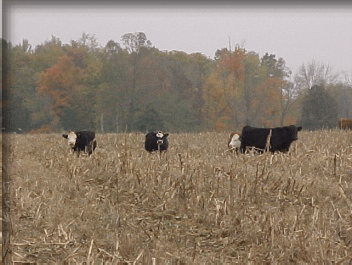 Stalks are best utilized for spring calving cows due to lack of sufficient energy for lactating or growing animals, especially over time, unless winter annuals or brassicas have been added. The addition of annuals such as my favorite combination of oats, a brassica such as turnips or radish, and a winter hardy annual like cereal rye make an excellent addition to stalks if they can be planted early. This mixture, especially if it has a lot of brassica in it, needs to be balanced with some dry material to be utilized most efficiently. Those high nitrogen and water containing turnips or radish are too rich to be grazed alone and are a great addition to corn residue. Adding these annuals not only helps stretch out those residues, but it helps the grazing livestock make better use of this feed and usually means a higher rate of gain. Rough estimating, corn stalks should be stocked at the rate of 1,000 pounds live weight per acre per 30 days. Though it can vary a lot, most corn produces about 56 pounds of residue per bushel. So, a 200 bushel corn crop should yield about 11,000 pounds of residue. Of that residue, about 40 percent is leaf and husk, the part that is most readily consumed. So in this example, there is about 4,400 pounds of desirable grazable fodder available or about 75 animal unit days at 50 percent harvest efficiency; and yes, they are going to waste some. One animal unit, which is 1,000 pound live weight, will consume about 3 percent of their weight in dry matter per day or roughly 30 pounds of fodder. You can do your own math from there using your livestock numbers and acres that can be grazed. Certainly, if annuals are also part of the picture, then there is even more available. Corn fields used for grazing that are highly erodible (HEL) must still comply with Farm Bill requirements after grazing, which can add even more value to grazable covercrops interseeded into the stubble. Refrain from feeding any supplements or hay in crop fields or leave livestock in the field over extended time frames, especially under wet conditions to prevent compaction issues the next crop year. Crop residue should be tested for nitrates if there was crop failure or chance that applied nitrogen was not normally utilized. Livestock water should also be readily available and ideally moved with the livestock to new allocations of stalks. Something tells me that we could have an early fall, so remember, earlier than normal, that sudangrass and sorghum-sudan hybrids, and johnsongrass produce a cyanide compound when frosted causing the production of the prussic acid. Livestock should be removed from these forages for at least two weeks to allow for the forages to “dry down” and the prussic acid to dissipate before grazing again. Frosted areas could start with only “pockets” in a field. Any regrowth from the base of the plant after a frost can also be very high in prussic acid. If in doubt about nitrates or prussic acid, test before grazing! White snakeroot is a poisonous plant that can be toxic even when consumed in small amounts. There are a few droughty areas left around the state. When forage is limited and if white snakeroot is present, remember this poisonous plant can be a problem. At this time of year the plant has numerous heads of small white flowers and is quite common along woodland edges, woods and streams. 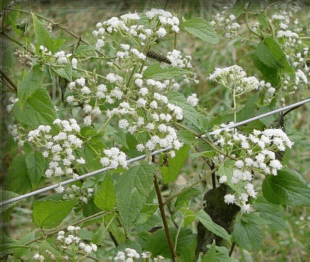 Livestock normally will avoid consuming white snakeroot under typical growing conditions, but as ample, desirable forage declines or disappears, poisonous weeds start looking good. Whether eaten in large amounts at one time or in small amounts over a period of time, both can be fatal. Nursing animals are often affected from the milk which is commonly fatal with no signs of ailment from the adult. If your grazing livestock have access to potential problem areas, it would be best to scout the area ahead of grazing. Small patches of plants can be removed but if there are too many, keep the livestock out! Leaves of the white snakeroot are opposites, have toothed edges, and taper to a point. I have been seeing quite a bit of this plant this fall. If you have problems identifying this plant, contact your local extension office for assistance. I’ll end this article encouraging you to think about not only how you are managing your pastures, but also encouraging you to think about how you might be influencing others. Just don’t let it get out of hand. As a really smart person once said, “If you get to thinking you’re a real person of influence, just try ordering someone else’s dog around.” Keep on grazing!